Got patching problems? Check the Boards for tips and solutions! 7.12’s the first patch in a bit that hasn’t come with a new or updated champion, but that doesn’t mean it’s one to sleep on. Required reading for your 7.12 matches: check out the support item sweep. We’re looking to create better item build diversity between tankier supports and their Enchanter compatriots, and changes run the gamut from cost adjustments up to a full-on rework to Zeke’s Harbinger (now Zeke’s Convergence). Past that, we have a healthy assortment of balance work, both to those recent projects we mentioned earlier as well as a few faces we haven’t seen for a bit. We’ve also got some wins outside the game! This is the first patch that’ll be played fully on the 10-ban system, and we’re excited to keep watching how the ban meta shapes up. The Crowd Control Score promised in midseason is here as well! Lastly, we’ve got a swaggy pair of legendary skins for Riven and Yasuo - solo lanes have never looked so fly. That’s it for this set of notes! Go get ‘em, champs. BUGFIX Fixed a bug where Shaco’s Jack in the Boxes were visible to all enemy players through Fog of War. Passive cooldown reduced. Q2 damage increased. It’s been awhile since our work to cut excessive strengths out of Camille’s kit and give her real weaknesses. Now that the Steel Shadow’s in a better place from an ability fairness/frustration standpoint, we’re in a good position to power her up a bit. 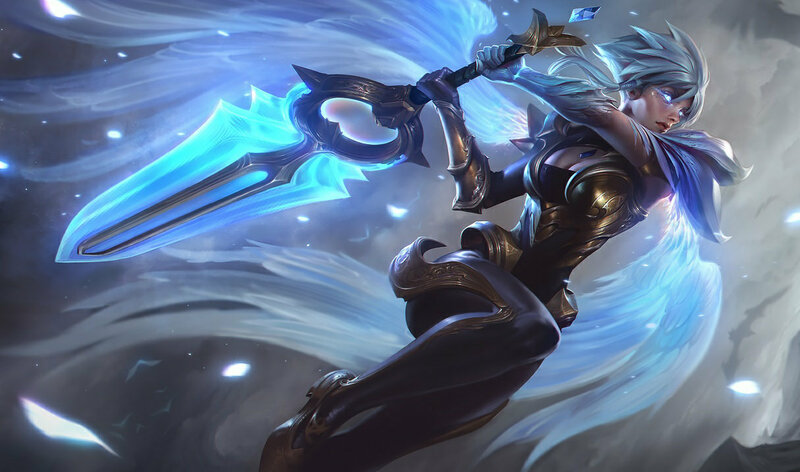 Reducing Adaptive Defenses' early cooldown gives Camille more opportunity to play aggressively in lane, while restoring the damage we previously chopped off Precision Protocol keeps her razor-sharp throughout the game. Attack speed slightly up. Base AD slightly up. Autos do more magic damage rather than physical. Last time we saw the Corkster bombing through the Rift he'd been doing so as a midlaner, packing obscene poke damage and wave-clear, a potent arsenal desirable for that role. We made some changes to curb that, but they left him feeling like a whiskey delta. We see an opportunity to help him out: we like him as a magic-damage option for the bottom lane marksman role. These changes are designed to reinforce that by making him a more palatable pick in bot lane, while further pushing his magic-damage niche. Ivern is already pretty strong, and with the incoming changes to Athene’s Unholy Grail (see below), we only foresee him getting stronger. As a result, we're pre-emptively taking some power out of Triggerseed’s damage. W now grants bonus range. Using Empowered Strike to reset his basic attack timer is Jax’s bread-and-butter, so we’re adding a little extra range to help that combat pattern feel a bit more fluid. Q base damage down but scaling up. R base damage up. Back when landing one shot of Jhin's ultimate pretty much guaranteed hitting the rest, his high base damage was downright excessive. Now that his ultimate is less reliable, we have room to add damage back into his rotation. E shield decreased. Mantra’d E shield on secondary targets decreased. Karma is already pretty strong, and with the incoming changes to Athene’s Unholy Grail (see below), we only foresee her getting stronger. As a result, we’re pre-emptively taking some power out of Inspire’s ability to nullify so much damage. Base attack damage up. E mana cost down. Last patch we made some major changes to Kindred, aimed at better delivering on the jungle marksman fantasy. 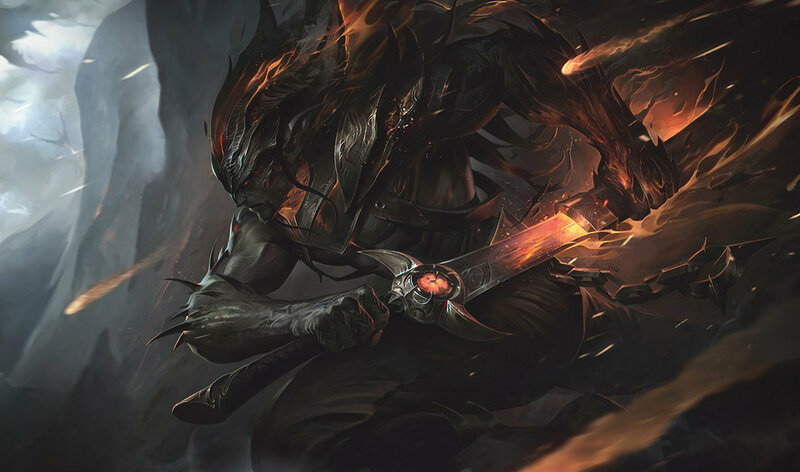 While there’s always a period of adjustment when a champion sees large changes to their base kit, Kindred came out struggling more than expected. These changes are just straight power increases across the board, and as players get less sheepish about new builds and playstyle, we should see Kindred’s eternal hunt become far more fruitful. GRACE PERIOD Zone duration now waits to begin counting down until Wolf reaches the cast location. Casting Dance of Arrows during Wolf’s travel time will still grant the reduced cooldown. Q and R damage reduced at later ranks. Now that Malzahar’s back in mid and speccing into damage-oriented builds, we’re tailoring his late-game damage appropriately. BUGFIX Quicksilver Sash and Mercurial Scimitar now properly purge only the suppression portion of Nether Grasp. Beam damage will continue to tick as long as Malzahar’s target stays in range (1250 distance). Passive shield now properly interacts with shield amplifying effects. Turns out Rakan’s passive hasn’t been scaling with shield-amplifying effects, which the Charmer (as an Enchanter) tends to have a bunch of. Sorry, bird boy. Base AD up. Armor per level up. W unburrow damage up. R more reliably hits targets. Rek'Sai’s ability update has left her a bit on the weak side overall. We’re looking to push some base reliability back into her kit, so we’re upping the acquisition range on Void Rush and feeding her some base stats. TARGET ACQUISITION Void Rush is now much harder to dodge. Rek’Sai’s target should no longer be able to walk out of damage range without exceptional amounts of movement speed (or a dash/flash). Heat drains more slowly. Q cooldown higher early, damage increased, now does decreased damage to minions. W shield amount up, duration down. E slow and damage up. We want Rumble’s opponents to have a clearer window to pick fights against him during laning phase. Flamespitter’s short cooldown allowed Rumble to be a constant threat against champions while taking no minion damage from trades (fun fact: ability damage doesn’t draw minion aggro), and this left no window for opponents to capitalise on him. We’re also making the heat system more intuitive and easier to pick up for new Rumble players. Can’t attack while casting Q, W cooldown increased. Xayah’s bringing a little bit too much damage during longer team fights later in the game, so we’re reducing how often she gets access to her steroid. W and E damage reduced. Zac’s damage is on the high side for a tank, so we’re dialing that back. We’re sure he’ll bounce back from these changes. Addressing a loophole that allowed Heimerdinger and Zyra to “attack” a target without actually attacking. This let them sidestep some of the intended risks of telling turrets/plants what to attack: standing still long enough to actually fire the attack, and drawing minion aggro as a result. FOLLOW THROUGH Heimerdinger and Zyra must now actually fire a basic attack to command turrets or plants to focus a target. Issuing an attack command and immediately cancelling it no longer triggers the redirect. At the moment, Locket of the Iron Solari and Redemption are such a dominant pair that most supports feel forced to build those two first. This effectively denies them access to the rest of the item pool in many games, especially given the other early investments supports have to make (boots, gold item, sightstone). The overall strength of Locket and Redemption is fine, but other items can’t compete with their uncanny synergy. Locket provides your team the durability to stay in the fight, while Redemption rewards your team for doing so. We’re refactoring both items to have a less perfect combo with each other, and ramping up their synergy with other support items. Essentially, Redemption should feel like a keystone for enchanters, and Locket for tanks. Nothing stops one set of supports from reaching across the aisle to grab items from the other class, but overall builds should feel more distinct between the classes. Base shield value down. Bonus health ratio added to shield. Locket of the Iron Solari lets tanks give a burst of tankiness to their team - perfect alongside their initiation or counter-initiation. However, it’s currently best-in-class on all supports, not just tanks. We’re linking Locket’s shield strength to typical tank stats so that if you want its full strength, you have to invest in it. REMINDER Locket chooses the higher level between caster and recipient when determining shield scaling - this is unchanged. The new bonus health ratio is always based off the caster’s bonus health. Health and health regen down. Mana regen up. Heal decreased but scales better with heal amplifiers. Redemption gives enchanters access to a heal - one of their class strengths - that excels in teamfights, but it’s currently best-in-class on all supports, not just enchanters. A spicy heal on healers is cool, but when it’s so easily accessible to tanks, the two classes lose some of their uniqueness. We’re linking Redemption’s heal strength to typical enchanter items and masteries so that if you want its full strength, you have to invest in it. Now builds out of Aegis of the Legion instead of Amplifying Tomes. Passive now creates slowing storm when triggered, instead of granting ability power and critical strike chance. When we looked at the support item landscape, we saw a lot of opportunity to amplify the Warden landscape by updating Zeke’s Convergence. Wardens excel at protecting a nearby champion, and we wanted to give them itemization that represents that fantasy. Knight’s Vow already does a good job at helping them keep their chosen target alive, but we felt there was room for an item which made them more worth the investment to keep them safe. As such, we shifted the stat palette of Zeke’s to be more tank appropriate. We also had concerns that the item itself was too complicated to use, leading to a lot of frustrating misfires - despite its very strong high moments when used correctly. We’re making the active much more reliable to use so that Zeke’s doesn’t make you feel like you’ve spent 2400 on a gamble. newUNIQUE PASSIVE Casting your ultimate near your ally surrounds you with a frost storm and ignites your ally’s basic attacks for 10 seconds (45 second cooldown). Enemies inside your frost storm are slowed by 20% and your ally’s attacks burn their target for 50% bonus magic damage over 2 seconds. newUNIQUE PASSIVE Frostfire Covenant: Basic attacking a burning enemy ignites your frost storm to deal 40 magic damage per second and slow by 40% for 3 seconds. CONDUIT BINDING RESTRICTION 60 second cooldown ⇒ Can’t be re-bound while Frostfire Covenant is on cooldown, and the binding active can’t be cast on the ally you’re currently bound to, or other allies that are bound by a different Zeke’s Convergence. Now converts mana regen into ability power. Less cooldown reduction. Athene’s is in a bit of a weird spot. Its 20% cooldown reduction and regeneration (health and mana) make it feel like a pretty good early item. However, it’s in competition with Locket and Redemption, both of which are unlikely to give up their first buy priority. Rather than overbuff Athene’s to make it more competitive early, we rejiggered it into a scaling item, like Rabadon’s Deathcap for enchanters. Point Runner makes sense for a siege themed item. newUNIQUE PASSIVE Point Runner: Builds up to 20% bonus movement speed over 2 seconds while near turrets, fallen turrets, and Void Gates. Tanks like cooldown reduction, right? Now builds out of Glacial Shroud instead of Catalyst of Aeons. Slow nova now cannot be triggered manually, and automatically triggers once near an enemy champion. Catalyst of the Aeons - thanks to its eternity passive - is a good item for champions who want long, extended fights where they can make the most of its mana/health restore capabilities. On the other hand, Righteous Glory is for champions who want to start a fight now. This mix of explosive and drawn out strengths is making Righteous Glory a bit too strong at everything, so we’re removing the Catalyst from its recipe and replacing it with Glacial Shroud. Separately, we’re also adding more counterplay to its active to help make it feel more fair to play against. Just a few usability improvements to the coin drop mechanic. Quality of life improvements and a buff-fix to Relic Shield and its upgrades. These status updates were a little too frequent. Stacking Doran's Ring allowed champions to bypass their weakness during laning phase, mana regeneration, in this case, and endlessly push, and shove enemies under the tower, even when behind, without any trade-off. Not cool, Nautilus. newMANA, PLS Mana return when killing minions is now UNIQUE. Doran's Shield should be your starting item when facing a bunch of harassment at early levels, but at its current tuning it’s the best items regardless of situations. We're pulling a potion off of it both to decrease its raw effectiveness and to make it have a harder time dealing with ganks and all-ins. Changing the icon so it doesn’t look quite so similar to another 150 gold, green, health-restoring item. PRETTY Icon has been updated! We're continuing to add more stats to make you feel as awesome in the end of game screen as you (probably) were in the game leading up to it. 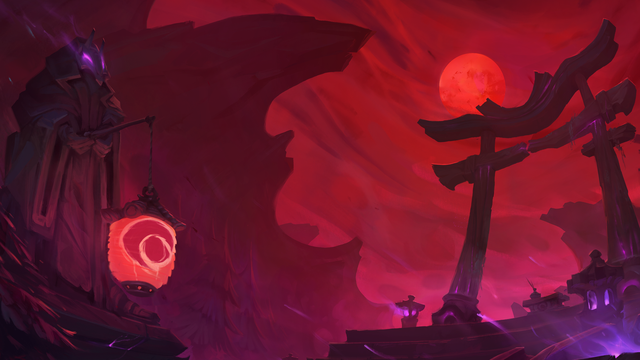 The Hunt of the Blood Moon looms into rotation from 6/16/17 12:00 PT - 6/20/17 4:00 PT, and 6/23/17 12:00 PT - 6/27/17 4:00 PT. Sacrifice Spirits, Demon Heralds, and enemy champions to gain points and the Demon Brand buff, which turns you invisible to hunt down your enemies. Only 21 of the most vicious champions are available for the Hunt (10 of which will be free to play while the blood moon still rises). Making it a bit easier to track who’s been talking to you, and when. newHOW POPULAR A “More Unread” bar will appear if you’ve got unread messages higher up or further down your friends list. Click the bar to automatically scroll to the message notification. This setting can be toggled off via the “Chat & Friends” tab of the Settings menu. We’ve made some minor adjustments to the 1-30 experience curve so players level at a smoother rate, rather than spiking at levels 5, 10, and 20. Total 1-30 experience requirements are very slightly lower. VS. begins during this patch. A world on the brink of ruin waits to be redeemed through Chaos or Order. Delve into a monumental legend and affect its conclusion by taking on event-exclusive missions. Completing missions grants tokens that help determine a victor, and you can also forge tokens into event-only loot. None can escape destiny, but you can determine it.